Team Canada’s finishes in recent years in international competition suggest that they’re trending upward. And as they enter the 2014 FIBA World Championships, they have plenty more potential for growth in the future. Since 2010, the Canadian Senior Women’s Team has been improving and getting better every single year. The talent level has significantly increased and will continue to do so as more and more young Canadian girls become part of the program. Expectations are also rising for the team as more and more Canadians are seeing the potential that Team Canada has to compete among the world’s best. In this tournament, Team Canada will need to show that they can compete with the top FIBA teams such as USA, Australia, France and Russia. Currently, Team Canada is ranked #9th in the World and can improve their ranking with a good showing at the World Championships. 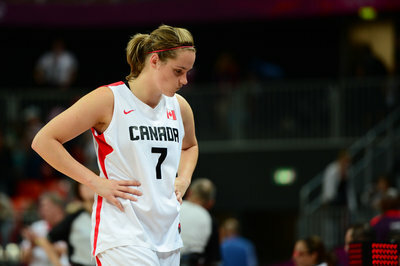 Team Canada is constructed with veterans and young players who, put together, can play well as a good basketball team. Yet while people often look at young players to make an impact and show their worth, it often comes down to the veterans who will have to deliver. In Team Canada’s case, it will be Shona Thorburn, Kim Gaucher and Tamera Tatham. All 3 players have extensive experience playing with Team Canada and it will up to those three veterans to decide how far Team Canada goes. Historically, Team Canada’s best finish in international competition was in 2013 when they finished in 2nd place at the FIBA America’s Championship. Their best result in a Worlds/Olympics was a 4th place finish in 1984 at the Summer Olympics. In 2010, Team Canada finished in 12th place at the FIBA Worlds. In 2012, they finished in 8th place at the Olympics. If they continue to trend upwards, they should aim for a top 6 finish at the Worlds. There is no doubt that Team Canada can achieve a top 6 finish. But, they have to go out there and prove it — they have to prove it to their country, other teams, and themselves that Canadian basketball is on the rise and it is a force to be reckoned with. Team Canada plays Mozambique early Saturday morning at 7 am EST in their first game of pool play in Group B (Mozambique, Turkey and France are also part of the group) and the game will be televised live on NBATV Canada and will be tape delayed on Sportsnet 1. To follow Canada’s progress through the tournament, stay tuned to our Team Canada storystream.